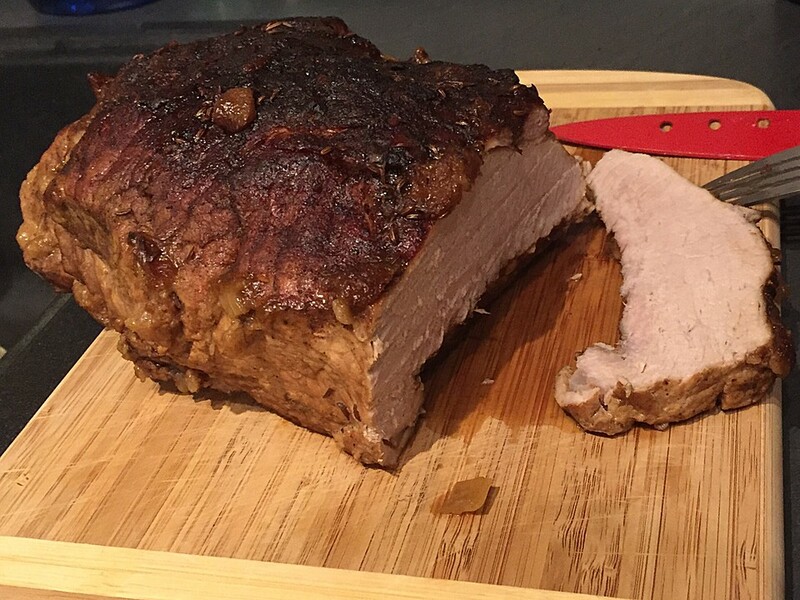 Learn today how to make a pork roast Franconia Style. The Frankenland or Franconia has many hearty and traditional recipes that we love. The roast will be cooked in the oven and comes with a thick and tasty sauce that contains bread and vegetable. Of course serve the dish with red cabbage and home made dumplings. Happy Cooking! - Spice the meat generously with salt, pepper and paprika evenly on all sides. - Chop onions fine, carrots should be cut in bigger pieces. - Pre-heat oven to 200 C or 390 F.
- Brown the meat in a bigger fire proof roast pan evenly but be careful and watch it because the spices would get black. So turn the meat fast. - Add the onions and carrots during the frying process and brown them as well. Important: The taste depends on the browning of the meat and the onions and determines the quality of the sauce as well. - At the end add the bread pieces around the meat and the caraway seeds. - When the roast is nicely browned place the pan into the oven for 30 minutes then reduce heat to 350 F (180 C). - Now prepare the broth by following this recipe - How to make a Vegetable Broth - or use German broth (not the packaged USA broth or Knorr USA won't work either). You can use half vegetable and half beef broth as well. - While the roast is cooking add on and on the broth and the beer. Cover the bread with the liquid. It must become very soft and should be completely cooked to a pulp. - Monitor the roast during the next 2 hours by using a cooking thermometer. Cooking time is between 3-3.5 hours (for 1 kg meat it is about 2 hours). - When the meat is done place it on a board. The meat is done when the temperature shows 85 C or 185 F.
- Remove carrots from the sauce and puree with a stick mixer. The bread will thicken the sauce and it should have a dark brown color.